Nissan is testing self-driving cars at one of its plants in Japan that can tow vehicles on a trailer to a wharf for loading on transport ships. The tests also can add to knowledge needed to take such autonomous driving onto public roads. Nissan executive Haruhiko Yoshimura said the company hoped to use the technology throughout the Oppama plant by 2019, and in overseas plants in the future. During a demonstration, a Leaf car with no one inside drove along the road, pulling a trailer with three other Leafs on it, stopped properly for other vehicles, and then veered into a car park. Kazuhiro Doi, a Nissan vice-president, acknowledged such glitches showed a challenge unique to the technology. "If there are drivers, they can take action," he said. "Mechanical operations are all there is in a driverless car." People still had to get inside each of the towed vehicles to drive them to the proper wharf, but Nissan hopes that as self-driving technology advances, cars will drive themselves into the ships on their own. Driverless cars are still not allowed on regular public roads in Japan, although major carmakers are all working on such technology. 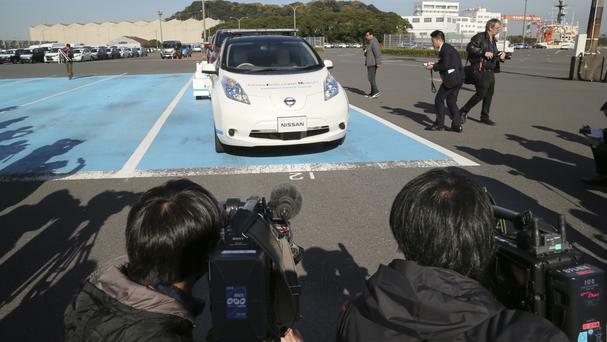 Driverless driving is legal within private facilities such as Nissan's. Nissan, allied with Renault SA of France, has been carrying out tests with driverless towing since last year.